Perhaps I should have taken East European studies in College, instead of Chinese studies. At least if I had learned Polish, I could have gotten a lot more out of this great monograph that arrived in my mail. I have not previously heard of this series from Poland, but a Google search turned up a Polskie Skrzydla No. 1, which focused on the SPAd 61 C1, 51 C1 and WIbault 70 C1. Polskie Skrzydla No. 2 focus on the aircraft flown by Polish aviators in France as part of the French Air Force (FAF) during the early part of World War II. After the fall of Poland, many Polish aviators escaped via Hungary and Rumania to get to the West to continue the fight against Nazi Germany. A great many of them made it to France. In February, 1940 an accord was signed that allowed for the potential re-creation of the Polish Air Force (PAF) within the FAF. I believe it was in March 1940 that Polish fighter pilots were assigned to sections within FAF fighter units – Groupe de Chasse (GC). The primary fighter aircraft allocated to the Polish pilots were the Morane MS 406, the Caudron CR714 and the Bloch MB151/152. Even if one cannot read one word of Polish, this monograph is a pure visual pleasure and a great amount of information can be gleaned from the pictures, profiles and charts. Starting with the pictures, and all things considered, there are a surprising number of good photographs of in service aircraft of all three types. Of course, there are also a good number of pictures of derelict and wrecked aircraft, obviously taken by German soldiers. Also, given the actual number of Caudron aircraft that were put in service, there are ample photographs of this aircraft. While a number of publications have well done profiles, Polish Wings seems to have taken them to a new level. The pictures and the profiles are well integrated. For each profile there is an accompanying picture of the actual aircraft. The profiles themselves are very well done. 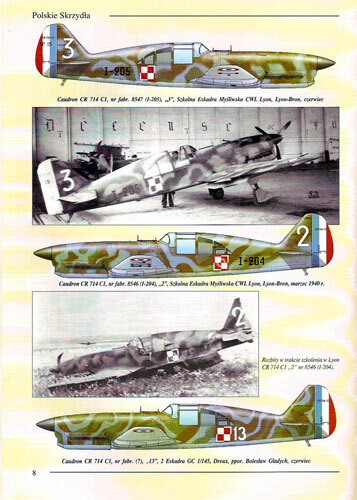 The illustrator has attempted to show the camouflage pattern of the specific aircraft pictured. A number of the profiles show multiple-views of the aircraft. That profile of the Bloch MB 152 in RAF markings really peaked my curiosity. The variety of camouflage patterns is also well shown for the three different aircraft types covered in the monograph. Unlike Luftwaffe and RAF camouflage, no two patterns appear to be identical. Even though the charts are not in English, one can make out serial numbers of aircraft, the units in which they were used and the pilots that flew them. There is also a brief discussion, in Polish only, of the painting of French aircraft in the 1940 campaign. The French color names are given along with the FS approximation. Finally, there is a 1/72 scale line drawing for each of the three aircraft. 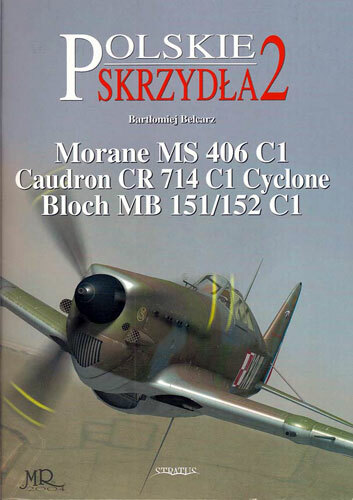 The bottom line on this monograph is that, even if you do not read a word of Polish, this is a must have if you have any interest at all in French aircraft or the Polish Air Force. With the help of this online Polish-English / English-Polish dictionary http://www.dict.pl/plen, perhaps one can get even more from this monograph.